Baldwin, Gordon, and Martin Jürgens. Looking at Photographs: A Guide to Technical Terms. Los Angeles, CA: J. Paul Getty Museum, 2009. Browne, Turner, and Elaine Partnow. Macmillan Biographical Encyclopedia of Photographic Artists and Innovators. New York: Macmillan; London: Collier Macmillan, 1983. Provides basic biographical information on 2,000+ photographers and innovators in the field (including roughly 500 from the 19th and early 20th centuries); each entry also lists publications, portfolios, collections, dealers/representatives, and address. Photographers were chosen on the basis of “dedication” (photography had to be “a major passion”) and “visibility” (work had to be available in photographic books, journals, museum collections, or through grants and awards, though being well known was not a criterion). Includes inventors, photographic curators, museum directors, gallery owners, photo-historians, and photography critics in addition to photographers. The Getty Conservation Institute, Dusan Stulik, and Art Kaplan. The Atlas of Analytical Signatures of Photographic Processes. Malibu, CA: 2013. Free individual PDF guides containing in-depth information on photographic processes, including technical data, history, and keys to identification. Research is ongoing, and the guide is updated regularly. Hannavy, John, editor. Encyclopedia of Nineteenth-Century Photography. New York: Routledge, Taylor & Francis Group, 2008. Aims to be “an essential reference work for anyone interested in the medium of photography,” based on scholarly research that has “established the role of many hitherto unrecorded figures, measured the achievements of many of the leading practitioners against contemporary appraisal of their work, and placed the history of photography’s first century within a social and economic context.” Includes articles on major inventors, manufacturers, organizations, and supporters of the medium as well as key photographers. Access points are provided by an alphabetical list of entries, a thematic list of entries, and a thorough index. Each article includes cross-references and bibliographies. Lenman, Robyn. The Oxford Companion to the Photograph. Oxford; New York: Oxford University Press, 2005. Includes numerous technical entries (e.g. substantial articles on lens development and three-dimensional photography) as well as articles on photographic theory and techniques. Contains many national and regional entries not available in other reference books (e.g. Africa and Scandinavia). Strong in Japanese and Chinese photography. Strong emphasis on photography as a social and political practice, with articles on tourism, advertising, propaganda, military photography, and photojournalism. Art photography is also well represented. Includes a limited number of biographical articles. Most entries include bibliographies. Stroebel, Leslie, and Richard Zakia. The Focal Encyclopedia of Photography, 3rd Edition. Boston: Focal Press, 1993. Especially useful for technical definitions; also includes biographical entries and entries on theory, history, and antiquated processes. Technical details and definitions are well illustrated with black-and-white line drawings. Each alphabetical section begins with a list of abbreviations that begin with that letter (e.g. LED: light-emitting diode). Warren, Lynn, editor. Encyclopedia of Twentieth-Century Photography. New York: Routledge, 2006. Scholarly discussion of 20th-century photography history introduces the reader to a history of the technical issues that have changed over the century, defines the concepts, terms, and themes that evolved over 100 years, describes the role of institutions and publications in the shaping of that history, and explains the development of photography in specific countries and regions around the world. Gathers information on “the most often cited names, terms, concepts, processes, and countries,” and provides the historical and theoretical contexts for understanding each entry. Includes extensive cross-referencing, substantive bibliographies, analytical index, and 600+ illustrations. Charles Négre. 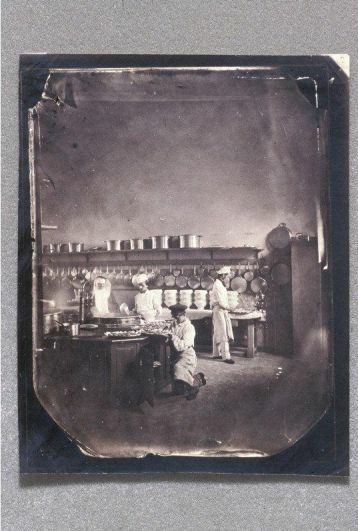 Kitchen of the Imperial Asylum at Vincennes, 1859. Salt print from wet-collodion-on-glass negative. Sterling and Francine Clark Art Institute, Williamstown, MA. Eugene Atget. Corner of the rue de Seine and rue de l'Echude, ca. 1919. Arrowroot print from glass negative. Sterling and Francine Clark Art Institute. Dept. of Prints, Drawings, and Photographs.